Some help shopping at the shops onboard! When you’re on a cruise ship at some point you will be stepping into the on-board tax and duty free shops. The article will help you out especially if you are a first time cruiser as all the different events each day can be daunting and confusing. 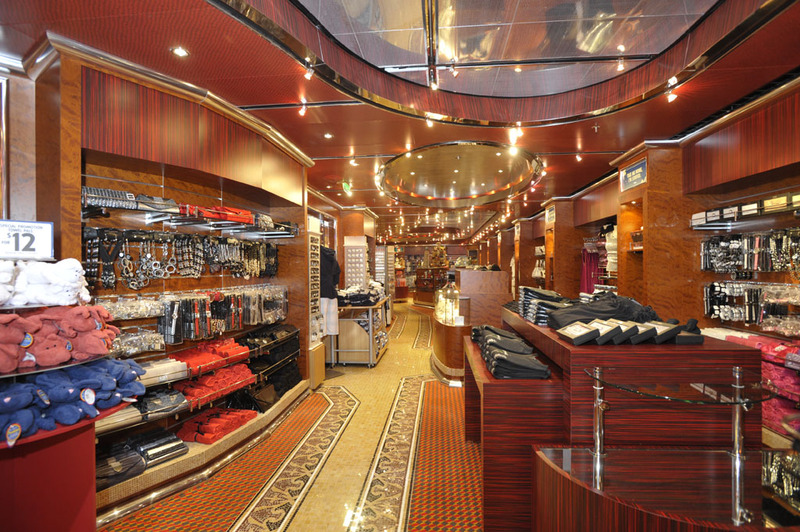 So first let’s explain a few things about the gift shops on-board ships. On most of the large cruise lines a separate company operates the tax and duty free shops so even if you’re cruising with a different cruise line you may come across the same products, promotions and even the staff! Yes that’s the staff, because they are not employed by the actually cruise line, they are employed by the company which operates the gift shops. It means they can easily move from one cruise line to another. Will this be cheaper on the last day of the cruise? Well the answer is NO! Passengers must realize that all the products they see from the first day they step on the ship will stay the same price for the entire voyage. Sales and deals are very important when shopping on a ship, a question which is probably the most asked in the gift shop is “Will this be cheaper on the last day of the cruise?” Well the answer is NO! Passengers must realize that all the products they see from the first day they step on the ship will stay the same price for the entire voyage. If there ever is an announcement over the ship’s PA system about a huge sale starting in the shops then it’s usually a new product which hasn’t been seen before and is only brought out for that event. When you do see these sale events take full advantage of them because it happens only once during the cruise. The biggest sale is on the last day of the cruise but as mentioned before it won’t be any of the products on the shelves which have been out everyday. Sometimes the tax and duty free shops can be very busy with long lines. The best time to go shopping in the day is when fellow passengers are on the open decks getting some sun, that’s if it’s a day at sea of course! When the ship is in port then by law the tax and duty free shops on-board cannot open or sell anything but when the ship sets sail and is back in international waters they will open back up. Just remember if you like something in the shops from the first day then buy it and don’t wait because it won’t be cheaper on the last day! In the evening when there are shows going on, the gift shops and pretty much all the departments around the ship are quite and that’s a good time to have a browse around but make sure you’re done before the shows end as the gift shops are always busy between the showtimes with passengers purchasing snacks and essentials for the evening. Another good time to go shopping is at dinner time when the only thing on a guest’s mind is all that amazing food from all the different dining venues on-board. That’s also the time you will see the gift shop staff filling up the shelves and preparing for the busy times or next day’s promotions. Last day shopping can be very busy so try to get all your souvenirs for family and friends back home before the last day. Expect to see very long lines in all the shops and unless you want that day’s special promotion item then I wouldn’t bother going. Just remember if you like something in the shops from the first day then buy it and don’t wait because it won’t be cheaper on the last day! It also depends which cruise line your on as some operate slightly different from others. I hope this has helped you in getting the best on-board shopping experience. If anyone else has any other tips or experiences to share then feel free to post a comment below.